Mount Pengsong just a hill of black rock with shady trees, with a peak height of about 200 meters above sea level (masl). But interestingly, from the summit of Mount Pengsong, we can see and enjoy the beautiful panorama of the city of Mataram and West Lombok from various directions. 13121003962041979492Di this peak also, there is a Hindu place of worship, the Temple Mount Pangsung, which is said to be the first and oldest temple on the island of Lombok. Pengsong mountain village located in Kuripan, District Labuapi, West Lombok, located about 10 km to the south of the airport Selaparang, Mataram. Using a taxi is only about 15 minutes from the airport, at a cost of approximately Rp50ribu. An area of ​​over 11 hectares is designated as one of the attractions of this since 1996, like a miniature forest. Many types of shade trees, banyan start albasiah until hundreds of years old. Flocks grayish brown monkey, berhabitat here, with all their behavior is tempting visitors. 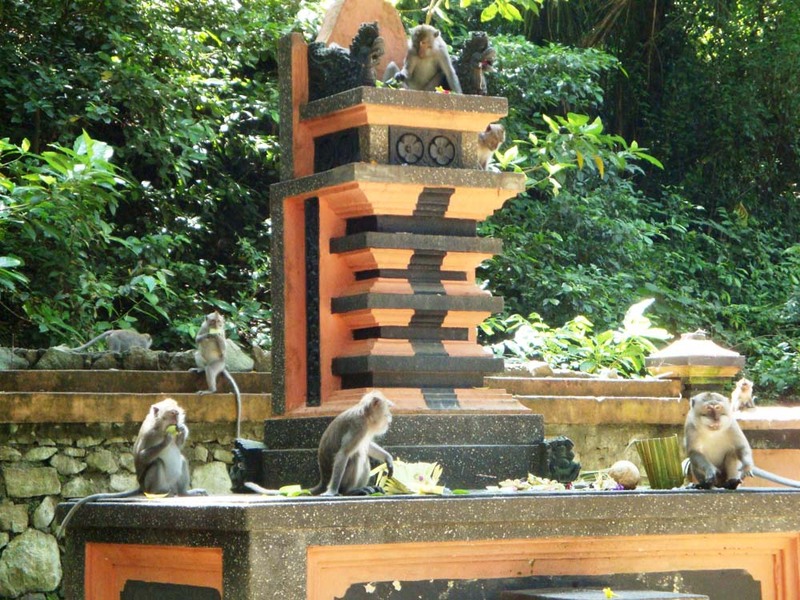 "It was nice to see these monkeys fighting over food, funny," said Hari (43), domestic tourists from Surabaya, East Java. Heriyadi with his wife and three children spent four days, for a trip to Lombok, during the year-end holiday season. Mount Pengsong become one of the tourist destination, in addition to the already famous Senggigi beach, and centers on Sukarara woven fabric, in Central Lombok. 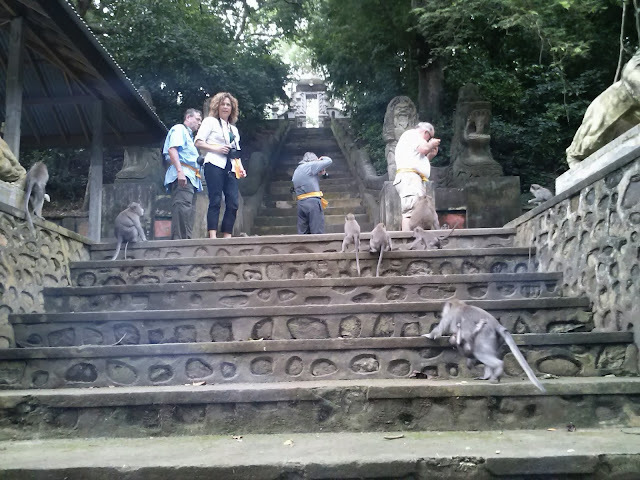 As always, if there are visitors who come, hundreds of monkeys immediately greeted and surrounded them, when arriving at the front yard area of ​​Mount Pengsong. These monkeys were given peanuts or snacks awaits brought. Tickle their behavior, there is a scramble food and chases, there are only brave waiting in the distance. Starting from a large stud, until the female monkeys were mengendong baby. 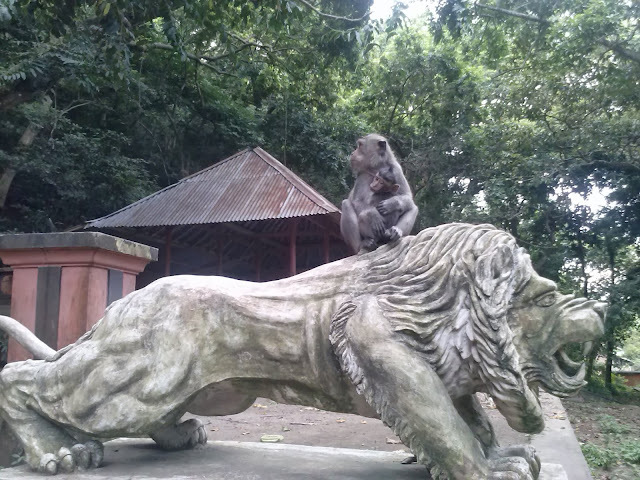 These monkeys will always follow the visitors who want to climb the summit of Mount Pengsong, along the way. But, before getting into the area, visitors must obey the rules. For example, visitors will be given a yellow shawl cloth tied around the waist prior to entry into the region. In addition, women who are menstruating are also forbidden to enter this area. Therefore, this tourist area is a sacred place for Hindus, and is still used for worship. Shady and cool, is the first impression when entering the tourist area of Mount Pengsong. Various types of trees grow leafy, some of which are hundreds of years old banyan tree with roots hanging thick. There are springs that can be found before it began to climb. Location springs "Mumbul Tirta Sari" is usually used Hindus worship the first stage, before the shrine to toss, and the Temple Mount Pangsung are located higher. Although the ascent is readily available throughout the steps of stone and stucco, to reach the summit of Mount Pengsong was not an easy thing for unusual climbing. After all, after reaching the peak, fatigue must be relieved with the beautiful panorama that can be enjoyed. Building the Temple Mount Pangsung look elegant with unique reliefs. Temple looks clean well maintained, even though hundreds of years old. From this peak, the scenery of rice fields and settlements to the bay waters Sheets can be seen on the South side. To the East, Rinjani peak can be seen if the weather is sunny friends, so even in the direction of western charm of Mount Agung in Bali did not escape from view. Mount Pengsong been defined as an area of ​​cultural heritage since 1996 ago. Since then the Government of West Lombok assign it to be one of the region's natural attractions. According to the Temple Mount Pangsung Stakeholders, Jero Mangku Semadiyatna, this temple stands about 1514 by Ida Wayan Betara Sebali, a Hindu monk of Geria Pendem, Karangasem, Bali. "From the history, this temple is the oldest in Lombok," he said. Until now, the Hindus ngaturang or worship in this holy place not only come from Lombok, but also from Bali, Yogyakarta, and Jakarta. There is a unique time of worship in this temple. The faithful who came to bring offerings (prayer offerings) for ngaturang, must be smart if you do not want to browse the offerings herd of monkeys captured before offered. "So we were given this by the catapult rubber Pura stakeholders. To scare the monkeys, "said I Nyoman Slot, who worship at the Temple Mount Pangsung. Nyoman deliver uncle, I Wayan Ngarba, from Bangli, Bali, who was ngaturang at Temple Mount Pangsung. But do not worry. Therefore, catapults used without stones so as not to hurt the monkeys are funny. Only the sound of the beat of the rubber, the monkey must dodge and run away. When the monkeys came about to take fruit and snacks that are dihaturkan in worship, rubber slingshot was pulled and snapped. Monkeys were running around to hear the sound of the catapults. "If outworn (Content offerings completed offered in worship) why not, you should not eat," said I Wayan Ngarba, while providing fruits and snacks to herd monkeys, after worship on the Temple Mount Pangsung. In addition to the Temple Mount Pangsung valuable historical marker at the same time the influx of Hindu people of Bali to Lombok first, the tourist area of Mount Pengsong also marks the colonial era Japanese soldiers on the island of Lombok. That said, the name is taken from the acronym Mount Pengsong Kepeng Song or broad money. These coins are used as a medium of exchange in the colonial era. "Back when the Japanese army went, money bolongnya supposedly widely grown in the region. Hence its name from the word Kepeng Pengsong Mountain Song, "said Jero Mangku. This tourist area is an interesting place to visit. Only, the attention of the local government of West Lombok still seems to be lacking, to organize this area better. Building portals that are usually used for admission in the attraction, looks damaged and no longer maintained at the front entrance area of ​​Mount Pengsong. Although the available public bathroom, but in this area is hard to find trash, trash pack so much spilled food and drinks brought visitors. Lack of attention to this local government, recognized also by stakeholders Temple Mount Pangsung, Jero Mangku Semadiyatna. "We've sent a letter to the local government through the Department Periwisata West Lombok, so that bins. We only ask four units bins, tai till now no response, "he said. 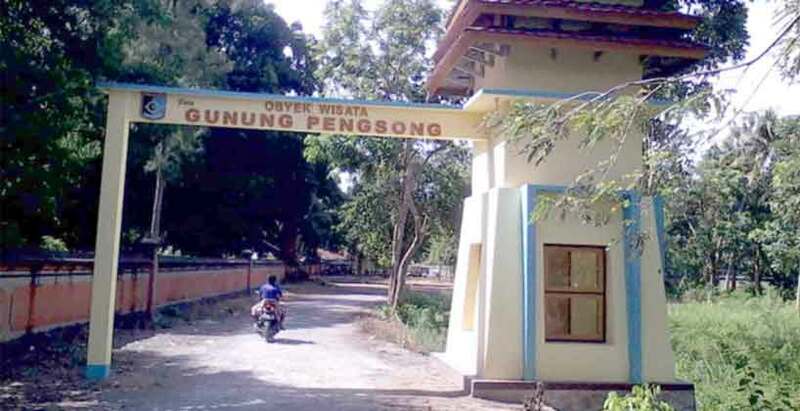 Since 2002 ago, Jero Mangku Semadiyatna with two other stakeholders, god Mangku Kawi, and Gusti Mangku Dharma given additional tasks by the responsible local government of West Lombok to hygiene problems in the region. In addition to serving the people who serve, they are also in charge of sweeping and cleaning the leftover food waste brought visitors. In fact, visitors to this area are numerous, ranging from local travelers, domestic, to foreign countries, in addition to Hindus who come to worship. Location Mount Pengsong close to coastal resorts Kuranji - one of the attractions beach in West Lombok - makes a lot of visitors to the beach are also stopped by the Mount Pengsong. "If we thought this task too heavy, clean up the area which covers more than 11 hectares. Until now we were cleaning, no special cleaners from the local government. We also work only armed bhakti alone, there is no local government's attention, even though we were given this assignment since 2002 ago, "he said. Jero Mangku recollection, West Lombok Regent Zaini H Arony never promised financial assistance for this tourist area, when the Regent Zaini filming the movie "Mystery of Mount Rinjani", beginning in 2010. But, somehow, until now that promise has not been realized as well. "Though we only ask four large bins only, to accommodate visitors garbage," he said. Lombok is a beautiful island with a variety of attractions that can be enjoyed. Start from Senggigi beach, Mount Rinjani, Gili-Gili series, even many beautiful buildings such as Pura Pura Batu Bolong, Senggigi, West Lombok Lingsar, and also the Temple Mount Pengsong this. Acculturation slogan makes a number of tour guides "in Bali you can not see Lombok, but Lombok you can see Bali" to dupe their guests. No wonder the government finally Nusa Tenggara tourism as a mainstay programmed brave second after agriculture. Now local governments keen to promote tourism potential of Lombok and Sumbawa in the Visit Lombok Sumbawa 2012 with the target of bringing one million tourists per year. 0 Response to "WISATA GUNUNG PENSONG DI LOMBOK BARAT NTB Mount Pengsong, Not The Usual Travel "